The Giant Soccer Ball Pool Float will score a goal for the whole family this summer! 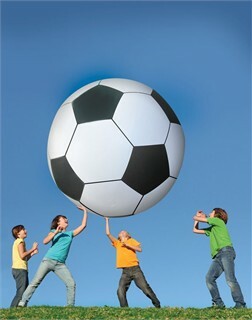 Perfect for the swimming pool, day at the beach or fun in the park, this 6' tall inflatable soccer ball can safely be kicked, thrown or headed for hours of fun. This item is made of durable vinyl and is intended for ages 15+. Availability: The Gigantic Inflatable Soccer Ball Float takes approximately 1 business day to leave the warehouse. Note: This item cannot ship to PO Boxes, APO Addresses, Alaska or Hawaii.